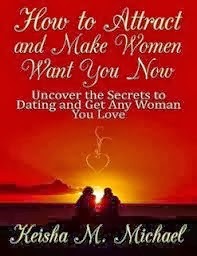 Keisha M. Michael's "How to Attract and Make Women Want You Now" is a how-to book on optimizing the way you act and present yourself, so that you will have more success with women. The brief book is divided into short chapters, each covering a topic (appearance, conversational topics, etc). One of the best things about this book is that it is practical. For instance, Michael doesn't say to start taking steroids and get plastic surgery to improve your image; she suggests simple, easy techniques for improving yourself. Another highlight of the book is that the many of the suggestions it makes for improving your success with women are also applicable to other areas of one's life; for example, the book covers how to eliminate negative thinking and how to improve your self-esteem. The book's array of topics, from how to keep good posture to how to start a conversation, are pertinent and teach everything you need to know about improving your presentation to women. "How to Attract and Make Women Want You Now" is the perfect book for any guy looking to improve his success with women by making simple, easy, healthy adjustments to his life.